Animal tissues. Adipose tissue. Atlas of Plant and Animal Histology. Adipose dipose is a specialized connective tissue that functions as the major storage site for lipids. It can be regarded as a rather unusual connective tissue since it has very little extracellular matrix. However, it is developed from mesenchymal cells during embryonic development, the same cells that give rise to the other connective tissues. Adipose tissue is present in mammals and some non mammal animal species. Adipocytes are the cells that form the adipose tissue, and they have the ability of synthesizing and storing large lipid drops in the cytoplasm. Fat is a very suitable storage material because it contains approximately twice amount of energy than carbohydrates and proteins. Adipocytes are usually found in large and dense groups to form adipose tissue, although they can also be found scattered in the loose connective tissue. Differentiation of white fat and brown fat adipocytes from mesenchymal cells. MyF5 is a marker of cells to be differentiated in muscle cells, although they can also become brown fat adipocytes. Mesenchymal cells that become white fat adipocytes do not express this marker. Among white fat adipocytes, there are cells showing morphological features, and possibly functions, similar to those of brown fat adipocytes, but they are developed from white fat adipocytes. That is why they are named as beige adipocytes. (Modified from Saely et al., 2010). There are two types of fat tissue: white fat and brown fat. White fat adipocytes contain one large lipid drop in the cytoplasm (unilocular adipocytes), whereas brown fat contain many small lipid drops in the cytoplasm (multilocular adipocytes). The white color, sometimes yellowish, or the brown color is the color of the fresh tissue, before experimental techniques. Although both types of fat tissues differentiate from mesenchymal cells, they do it from different cell populations. Actually, brown fat adipocytes share mesenchymal progenitors with muscle cells (see figure). Distribution of white and brown fat in the human body (modified from Gesta et al., 2007). White adipose tissue (or unilocular adipose tissue) forms the white fat, which is found in all the mammals and is the most abundant fatty tissue. In the white fat, adipocytes are round and large cells (more than 100 µm in diameter) containing one large lipid drop that occupies most of the interior of the cell. That is why they are known as unilocular adipocytes. The nucleus and the rest of the cytoplasm are located in thin layer close to the plasma membrane. In well fed animals, some adipocytes with more than one lipid drop are observed among the typical white adipocytes. These adipocytes with more than one lipid drop are not classified as multilocular or brown adipocytes (see below) but as white adipocytes showing an ongoing differentiation. Much less common among white fat adipocytes are the beige adipocytes, probably derived from white adipocytes, but with the same features as brown adipocytes. Differentiation of white adipocytes in a well fed animal. Mature white adipocytes on the right, and developing adipocytes on the left. Semithin section stained with methylene blue. White adipocytes are separated between each other by very thin layer of loose connective tissue, composed mainly of reticular fibers, which are secreted by the adipocytes themselves. Furthermore, every adipocyte is surrounded very closely by a thin layer of extracellular matrix, which is different from the connective tissue and is known as external lamina. This lamina is similar to the epithelium basal lamina. 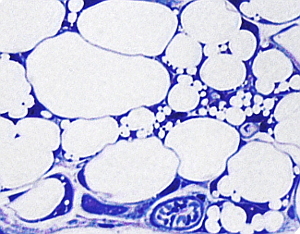 In those parts of the body under mechanical stress, white adipocytes are grouped in lobes separated by layers of connective tissue known as septa. Every lobe contain a more or less large group of white adipocytes. Other type of cells, such as mastocytes, macrophages, leucocytes, dispersed fibroblasts, and undifferentiated adipocytes, can also be found among the mature white adipocytes. Blood vessels and nerve fibers are extended through the conective tissue among the white adipocytes. In the white fat mesenteric areas, lymphoid nodes can be observed. White fat is highly irrigated by blood vessels, as much as the muscle tissue. The endothelium of the white fat capillaries is continuous. White fat recives two types nervous innervation: an innervation from sympathetic nervous system and another from sensory axons coming from the dorsal spinal ganglia. The nerves do not end onto the adipocytes, but around the blood vessels. White adipose tissue is mainly located in the hipodermis of the skin, i.e. it is subcutaneous. In humans, there area differences between men and women regarding the subcutaneous areas where white fat is more abundantly stored. In the inner part of the body, white fat is abundant in the mesenteries and intraperitoneal, and it is present, but less abundant, in the bone marrow and around inner organs. Hipodermis is a major storage location of white fat, but it is also an isolating layer that protect from low temperatures. Furthermore, instead of storage, white fat in the palm of feet and hands is intended for protecion against mechanical stress. White adipose tissue is one of the tissues that can increase and decrease its volumen dramatically during the adult period. This is mainly caused by the increase in size of the adipocytes, as well as the recruitment of new adipocytes by proliferation of precursor cells. In athletes, the white fat may be up to 2 to 3 % of the body weight, whereas an obese person may reach up to 60-70% of the the body weight. Between 9 and 18 % in men, and between 14 and 28 % in women, are considered as normal. If the percentage of white fat is higher than 22 % in men, and 32 % in women, then it is considered as obesity. White adipose tissue also works as an endocrine structure by releasing some molecules. For example, the leptin hormone, which controls the intake of food by acting through the central nervous system. There are other like resistin and adiponectin. In turn, white adipose is regulated by other hormons like noradrenalin and glycocorticoids, which facilitate the release of fatty acids from the adipocytes, and insulin that favours the triacylglycerides storage. In mice, it has been reported that in cold environments white fat adipocytes of inguinal fat depots may differentiate into cells with features similar to brown fat adipocytes. This happens without proliferation from undifferentiated precursos, but by a transdifferentiation process. This multilocular adipocytes are known as brite or beige adipocytes. Brown fat is made up of adipocytes containing many small lipid drops in the cytoplasm. Microscopy images show these cells with many holes inside because the histological processing removes lipids from the tissue. Brown fat is abundant in hibernating animals, in fetuses, and in perinatal mammals. However, it is very scarce in adults. During development, brown adipose tissue appears earlier than white adipose tissue. Visceral: perivascular (arteries: aorta, carotid, brachiocephalic, epicardial coronary, internal mammary, intercostal ; veins: cardiac and intercostal ), surrounding hollow organs (heart, trachea, large bronchi, mescolom, omentum principal), and around solid organs (paravertebral torax, pancreas, kidney, liver hilus). Subcutaneous: anterior muscles of the neck, supraclavicular fossa, under the clavicle, axilla, anterior abdominal wall, inguinal fossa. Brown adipose tissue is divided in large and small lobes separated by connective tissue. Blood vessels and nerves run through the connective tissue. Brown fat is innervated by sympathetic nervous system, that after stimulation leads to brown adipocytes to generate heat. The terminals of the symphathetic axons directly stimulate the adipocytes. Brown adipocytes are smaller than the white adipocytes, and show a rounded nucleus. The brown color of this fat tissue is caused by the many mitochondria located in the cytoplasm of the adipocytes. These organelles contain a large amount of cytochrome oxidase. The dense vascularization also contributes to the brown color. Gesta S, Tseng Y, Kahn CR 2007. Developmental origin of fat: tracking obesity to its source. Cell. 131: 242-256.